TO EMERGE IN A GIVEN SQUARE! Model submarine class EATING has always been one of the most interesting, especially for juniors. Such “free-floating” model require from the constructor of ship models awareness of the ships are prototypes, ability to work with the most modern materials and equipment, knowledge of basic fluid dynamics, electrical engineering and electronics. As a prototype of the model was chosen by the American submarine “George Washington”. This submarine with a nuclear power plant was armed with sixteen ballistic missiles “Polaris”, and had six bow torpedo tubes and eighteen anti-submarine torpedoes, MK-37. Boats like “George Washington” was launched in the years 1959-1961. 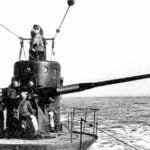 Their standard was a displacement of 5400 tons, underwater — 6700 t, surface — 5600 T. boat Length — 115,8 m, width — 10 m, draught 8,9 m. Surface speed was 15 knots underwater — about 25. The nuclear power plant had a capacity of 15 thousand HP continuous stay under water for up to 60 days. The crew of 100 people. Missile submarines of this type were intended for the application of atomic strikes on major military and industrial centers, naval bases and other strategic and operational objectives. The construction of submarines with nuclear power plants began in the USA in the fifties of the last century. 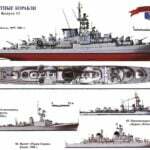 Interestingly, these submarines are based on the spent project torpedo boats “Skepe” by inserting it into compartments of missiles and fire control with a total length of 39 meters. The choice of the prototype model submarine “George Washington” was determined by relatively simple hull shape of the submarine. As the largest length class models EATING competition at a distance of 25 m must not exceed 1.25 m, it is advisable to turned out to be a scale of 1:100, so that the length of the model is 1158 mm. 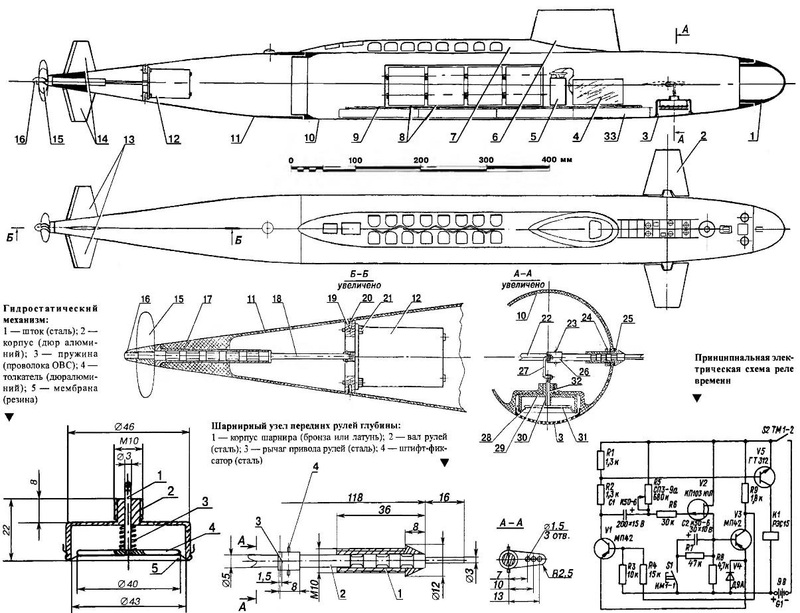 The case of The model of the submarine consists of three parts: the aft, middle and front fairing. In the aft-rotor complex models in the mid — block chassis batteries, electronic time relay with the power source and the hydrostatic mechanism. Glue case the easiest way of fiberglass and epoxy on the blank. To glue the housing preferably in three stages: first utformat the front, then the back and lastly the middle part. The shells are padded mutually connecting the ends, then glue them inside of the fiberglass ring elements of the connectors. The connectors sealing is provided by rubber rings. The basis of the complex-rotor models — motor MU-30 of 40 watts, which at a nominal voltage of 27 V consumes a current of about 5 A and has a speed 5580 rpm. the Engine is mounted in the rear of the chassis in the duralumin mounting washer affixed to the shell by four screws M4 and reformuvannia epoxy filler. Stern tube machined from bronze stern tube shaft — steel. Sealing of these elements of the complex-rotor — multi-compartment: with the introduction of the shaft in the stern tube in each cell any is injected with a syringe of grease. The engine and stern tube shaft connected to the swivel coupling is a hollow cylinder with a diametrical slot on the motor shaft and diametrically the same pin mounted on the stern shaft. In the case of a stern tube is glued into the pre-engine mounting Assembly with deadwood dural washer. The propeller mini-submarines — shestilopastnye with a diameter of 60 mm and pitch of 40 mm. Screw is made of brass parts — Central hub and blades connected by soldering. Screw fastening on the shaft — shaped nut fairing. The electric motor is powered by block 16 of dry cells. The domestic battery of the required size are called the 1.6 FMC-U-3 or “373”, list the same types of commercially available imported elements does not make sense — it is advisable to choose Alkaline battery. Batteries are housed in a plastic case and are connected in series so that the voltage of the current source is 25.6 V.
In the front part of the shell model, as mentioned, is located a hydrostatic mechanism for a mini-submarine to move at a certain depth, not floating on the surface and not plunging to the bottom of the reservoir. The system is a cylindrical aluminum box with a spring loaded pusher coupled to a thrust with the horns on the shaft of the front wheels of depth; the exterior of the box is draped in a thin rubber membrane. When the mini-submarine is on the surface of the water, the front controls the depth is inclined from the horizontal approximately 5 degrees which allows the model during its movement to start the dive. With increasing sea pressure, the membrane begins to push on the pusher, and that, in turn, reduces the negative angle of the rudders depth. The hydrostatic adjusting mechanism shall be such that the model on the 25-metre distance moving at the optimal depth is about 0.3 m. to Make it convenient in the tub, having to immersion in 0.3 m handlebars is horizontal. The model uses a homemade electronic time relay, providing a delay time from 2 to 80, which is powered by three parallel-connected batteries “Crown” with a nominal voltage of 9 V. the relay for the S1 button “start” and exposure time is adjusted by changing the resistance of the variable resistor R5. Time relay going to the circuit Board from foil fiberglass. If errors when installing the relay, the adjusting device is not required. To install the relay in a model submarine, it is recommended to make for him a sealed plastic case. In the lower part of the body, under the battery box and the pencil box time switch is installed lead ballast.